In the 1920s, fashion magazines were the principal source for news of the latest Paris couture. One of the most famous and long-lived of these journals was L'Art et la Mode, published from 1880 to 1967. L'Art et la Mode captured the glamor that was Paris in the Twenties, from days at the races to nights at the opera, from Sundays at the Ritz to Saturdays at the Folies-Berg re, and it followed the glittering circuit that flourished from Longchamps to Deauville to Cannes to Biarritz. The magazine was read avidly not only by the rich who patronized the couture, but also by the woman who relied on her "little dressmaker" to copy the styles depicted in the periodical. 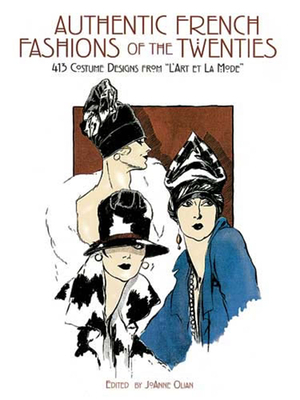 This lavishly illustrated volume offers 138 dazzling pages from L'Art et la Mode featuring fashions for all occasions by the great French couturiers of the Twenties--Patou, Worth, Molyneux, Doucet, Paquin, Vionnet, Lanvin, and Chanel among them. Selected by JoAnne Olian, curator of the famed Costume Collection at the Museum of the City of New York, a wealth of designs include stylish outfits for winter sports, hunting season, tennis, golf, and other athletic pursuits, as well as high-fashion ensembles for soir es and all manner of chic divertissements. JoAnne Olian is a former curator of the costume collection at the Museum of the City of New York and the author of numerous books on the history of fashion.